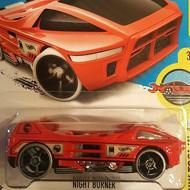 133/250 is a 2016 Treasure Hunt and 3/5 in the HW Moto series. 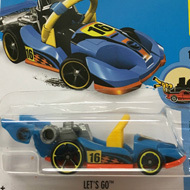 The Metlaflake blue bike is decorated with yellow flames outlined in orange, the Hot Wheels logo, and the low production symbol inside a flame by the rear wheel. The bike has gray handlebars, an unpainted metal Malaysia base, and MC3 wheels with orange rims. The Bad Bagger made its debut in the 2007 Hot Wheels Classics Series 3. 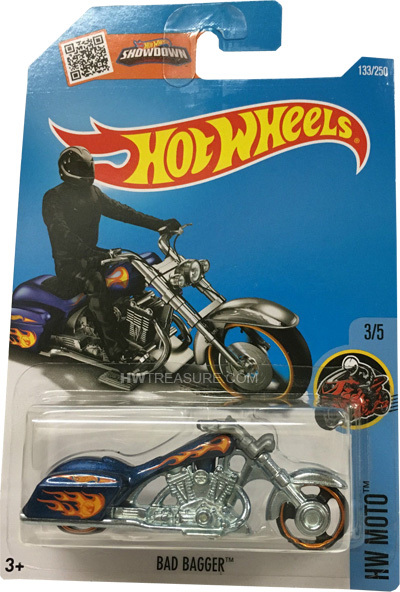 This is the motorcycle’s second appearance as a Treasure Hunt and previously appeared in the 2009 set.